In Hellerwork the entire muscular and skeletal structure of the body is considered and related to the individual’s sense of well being. Isolated changes or symptom relief are not the main concern of Hellerwork. Changes are experienced in relation to the whole body and whole person, and are aimed at improving the total health and wellbeing of the individual. How we live is often central to the health we experience, that is, how and what we eat, exercise, relax, breathe, love, and think. Perhaps most important is how we deal with the emotional issues that weave through our lives. We all experience periodic rough spots, occasional frustration, and stress, but at the other end of the continuum, there can are intense frustration, chronic conflict, and debilitating disease. From the very beginning of our lives, we accumulate tension. Chronic tension is far more prevalent, extensive, and pervasive than most people imagine. Acute tension is readily felt–such as stiffness in the neck or back. Chronic tension however is typically outside of conscious awareness. 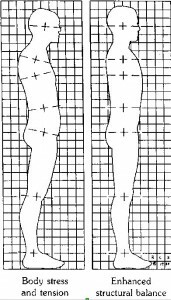 Large areas of the body are simply unavailable to kinaesthetic or direct felt awareness. The strains of life’s frustrations, stress, or the cumulative effect of poor health habits and physical accidents, all lodge in the body. All affect the structural integrity of our bodies. All affect the responsiveness and aliveness of our human tissues. All affect the quality of our participation in life. Relieving wear and tear, improving the structural integrity of the human body, and educating the client in developing awareness are central objectives of Hellerwork. The value of improving structural integrity is extremely beneficial, it powerfully lessens the effects of ageing, generating more available energy, vitality and flexibility, physically and emotionally. Hellerwork is a multi-level experience. 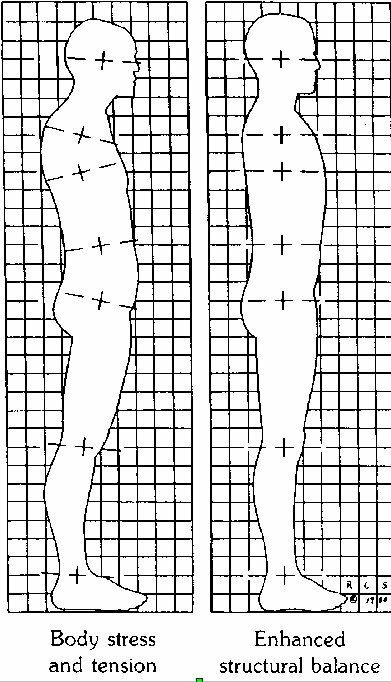 A full Hellerwork series consists of 11 one and a half-hour sessions, each concentrating on a different aspect of the body. A typical session consists of about 30 minutes working with movement and an hour of hands on bodywork. Through out both is an ongoing exploration. Much is communicated in the quality of touch. Learning to let go, to accept pressure, to surrender in the sense of yielding and flowing, to create higher levels of aliveness, to learn to “feel” one’s body from the inside, are among the lessons taught in Hellerwork. Physical awareness improves as clients learn to use their bodies in ways that minimise effort and tension. This heightened awareness is paralleled psychologically as clients explore how their thoughts, attitudes, and feelings have an impact in and through their body. Everyone can benefit from Hellerwork. As the work is designed to heal, rejuvenate and relax it is ideal for those either in pain, experiencing stress or tension, or with a chronic injury. For people interested in personal growth, optimal health and performance Hellerwork provides a uniquely investigative and insightful opportunity to explore and extend your self-understanding and potential. Hellerwork works with the whole person. It emphasises prevention and educates clients in self-care. It teaches the powerful relationship of the body and the mind.